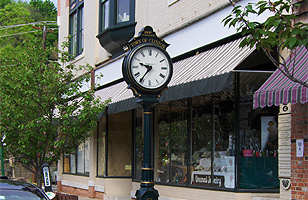 The Town of Clinton is nestled in the hills of Hunterdon County, New Jersey. It is the ideal American small town and has brought both visitors and movie producers here for years. Several movies that have used the town as a backdrop, including "In and Out" with Kevin Kline and "One True Thing" with Renée Zellweger and Meryl Streep. A charming, historic shopping area, cherry tree lined streets and a river winding through it, makes Clinton a picture perfect village. 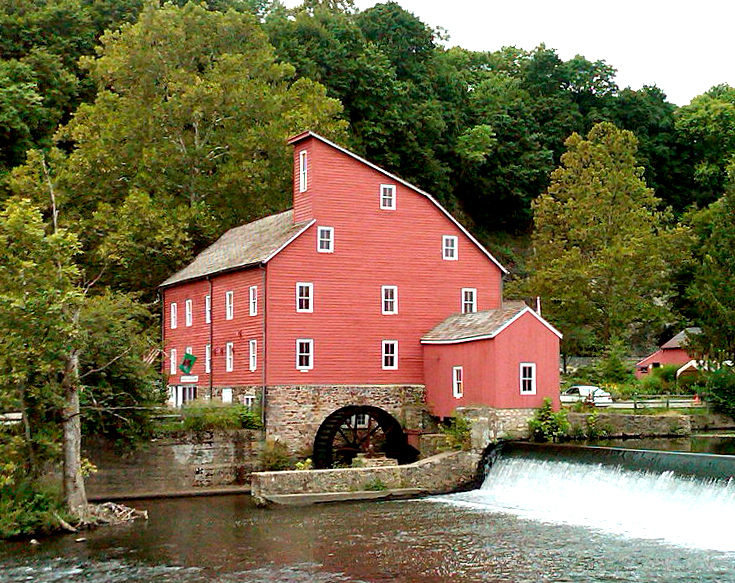 The town is perhaps best know for its landmark Red Mill which sits on the banks of the south branch of the Raritan River and has been at the very heart of the community since 1810. It features over 40,000 objects, special events and changing exhibits and always offers something for visitors to enjoy. Photographs of the familiar red building can be found everywhere, including official New Jersey tourism posters, roadmaps and postcards. It is the most photographed spot in New Jersey and one of the top ten most photographed buildings in the U.S. 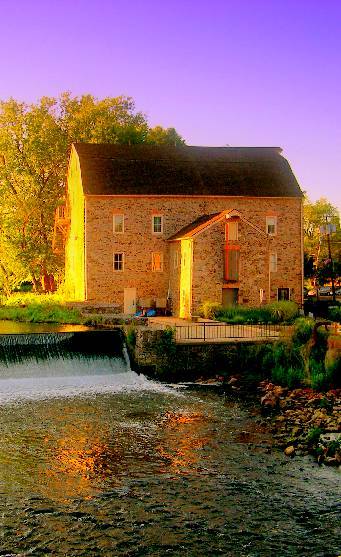 The neighboring Stone Mill, dating back to 1836, now serves as the Hunterdon Art Museum and offers exhibitions of contemporary art, crafts and education programs for adults and children. Just as impressive and its two historic landmarks is the town itself. Within the three-block business district, visitors will find unique restaurants, specialty shops, boutiques and galleries offering items produced locally and from around the world. Eighteenth and nineteenth century buildings frame the main street adding to its charm and warmth. Clinton has a well-established tradition of holiday celebrations, beginning with the annual Dickens Days weekend in late November followed by a Christmas Parade in early December. On Candlelight Night in December, luminaries line the streets and horse-drawn carriage rides highlight late-night shopping. For Valentine’s Day shopping, Clinton merchants offer various specials during Sweetheart Week from February 7-14. Clinton was incorporated as a town in 1865 and is not to be confused with the surrounding municipality of Clinton Township. The Town of Clinton is approximately 1.5 square miles and offers the convenience of easy accessibility to major highways such as Routes 78, 31 & 22. The residential areas are dotted with many lovely turn-of-the-century homes as well as neighborhoods with newer construction. There is also a townhouse community within the town boundaries. The surrounding Clinton Township municipality, with 33 square miles, remains heavily rural despite considerable housing construction in recent years. The Township's population is estimated at 13,000 residents. Both fishing and boating can be enjoyed in the South Branch of the Raritan River, which runs through the center of Clinton and is crossed by an historic iron truss bridge overlooking a scenic waterfall. 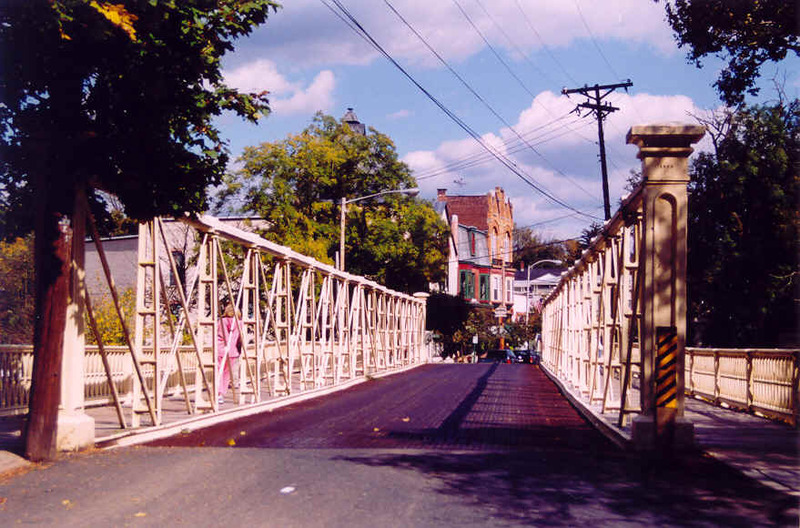 Other recreational activities include The Landsdown Trail which was once a spur line for the Lehigh Valley Railroad and is now a graded rail trail that enters in the south west section of town. The Spruce Run Reservoir and State Park Recreation Area,open year round, spans Clinton, Clinton Township and neighboring Union Township and offers 1,961 acres for picnicking, boating, fishing and seasonal camping. The Round Valley Reservoir and Recreation Area is New Jersey's second largest body of fresh water with 55 billion gallons of pretty blue water covering 2,350 acres and extendintg to a depth of 175 feet. The recreation area offers wilderness camping, beaches, trails, fishing and boating.